Twenty years ago, Fr George Haines had a vision of a children’s Mass filled with music. When he asked the congregation to help, three parishioners – Rachel, Doreen, and Margaret – tentatively came forward. During those early days, they would stand at the lectern to encourage the congregation to sing. They later described this as ‘a nerve-racking experience’. 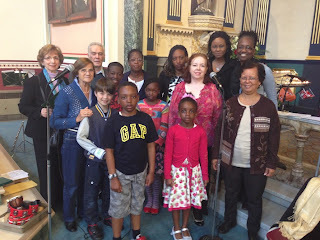 Since then the group has grown in number and is now known simply as the Family Mass choir, and formally as the St John the Evangelist Music Group. Over the years, St John’s Music Group has been leading the congregation at the 10.30 Sunday morning Mass with an array of hymns. Our aim has been to encourage people to play a more active role in the Mass. Various musically gifted individuals have taken the lead. Some parishioners will remember Sister Mary and Sister Kate taking the helm until 2005. Others may also recall that, for a couple of years, a young man called Duke put members of the choir through their paces, leading glorious and intricate harmonies. We are not professionals, but just another dedicated group of parishioners volunteering their time to help the congregation give praise to God. The Family Mass at St John’s would not be the same without those many people who contributed to singing over the past years. If you sing or play an instrument, and would like to join St John’s Music Group, please, contact Doreen Matthew through the parish office.